TSPSC to Fill 2108 DME Health Department Posts 2018, TSPSC to Fill 2517 TVVP Health Department Posts 2018, TS to Fill 3943 TVVP Health Department Posts 2018: TS to fill Paramedical staff, Staff Nurses in Health, Medical, Family Welfare Department 2017, TS Health Department to fill the Staff Nurses, Lab Technician Gr.II, Pharmacist Gr.II, Nursing, Radiographers, Pathology, LT Malaria posts on contract / outsource basis. TS Govt to fill the vacant posts of paramedical staff and nurses. Telangana Health department to fill 2,101 posts : State government has decided to fill the vacant posts of paramedical staff and nurses under the control of Director of Medical Education, Director of Public Health & Family Welfare, and Commissioner, Vaidya Vidhana Parishad on contract basis. Permission has been accorded to fill 2,101 posts across the State. G.O.Ms.No. 183; Dated:13-12-2017 :: GOVERNMENT OF TELANGANA, FINANCE (HRM-VII) DEPARTMENT, Public Services - HM&FW Department - Recruitment - Filling of (2108) two thousand one hundred and eight vacant posts of in various categories by Direct Recruitment under the control of Director of Medical Education, Hyderabad through the Telangana State Public Service Commission, Hyderabad - Orders - Issued. Ref: HM&FW (B1) Department U.O.NO.7753/B1/2017, dt:12.12.2017. Government have reviewed the Direct Recruitment vacancy position in HM&FW Department. After careful examination of the proposal furnished by the Department and keeping in view the actual requirement of manpower with reference to the nature of work and activities of the department and also the overall financial implications, Government hereby accord permission to fill 2108 two thousand one hundred and eight vacant posts of in various categories as shown below by Direct Recruitment under the control of Director of Medical Education, Hyderabad through the Telangana State Public Service Commission, Hyderabad. Govt Of Telangana, FINANCE (HRM-II) DEPARTMENT, GO.Ms.No.181, Dated:11.12.2017:: Public Services - HM&FW Department - Recruitment - Filling of (2517) two thousand five hundred and seventeen vacant posts in Telangana Vaidya Vidhana Parishad (TVVP) through the Telangana State Public Service Commission, Hyderabad - Orders - Issued. 1. G.O.Ms.No.175 Finance (HRM-II) Department, dt.28-11-2017. 2. G.O.Ms.No.179 Finance (HRM-II) Department, dt.11-12-2017. 3. HM&FW Dept., U.O.No.7045/B2/2017, dt.04.12.2017. activities of the department and also the overall financial implications, Government hereby accord permission to fill (2517) two thousand five hundred and seventeen vacant posts in Telangana Vaidya Vidhana Parishad (TVVP), sanctioned vide the G.Os. first and second read above, through the Telangana State Public Service Commission as shown below. 3. The HM&FW Department and the Commissioner, Telangana Vaidya Vidhana Parishad (TVVP) shall furnish details of all vacant posts authorized in this order, including the local cadre wise / subject wise vacancy position, roster points and qualifications, etc., to the recruiting agency immediately under intimation to Finance Department. The Department shall issue necessary amendments to their service rules / Bye-laws /Government Orders changing the existing recruitment procedure / recruiting agency, wherever necessary. TS to Fill 3943 TVVP Health Department Posts 2018: Govt Of Telangana, FINANCE (HRM-II) DEPARTMENT, G.O.Ms.No.179 Dated:11.12.2017:: HM&FW DEPARTMENT - TVVP- Creation of (3943) posts in TVVP Hospitals under the control of Telangana Vaidya Vidhana Parishad - Orders - Issued. 1. From the Commissioner, TVVP, Hyderabad, Lr.Rc.No.507/PlgI/TVVP/2017, dated:07.07.2017 & 06.09.2017. 2. HM&FW Department U.O.No.7045/B2/2017, dt.04.12.2017. 2. Government, after careful examination of the proposal of the HM&FW Department in the reference 2nd read above, hereby accord sanction for creation of the following (3943) posts in TVVP Hospitals under the control of Telangana Vaidya Vidhana Parishad. 3. The HM&FW Department shall furnish the Direct Recruitment vacancies out of the above sanctioned posts for issue of orders to the concerned recruiting agency so as to notify the same for recruitment. 4. The HM&FW Department are requested to take necessary further action in the matter accordingly. According to the order issued by the government, in the collectors’ conference that held recently, chief minister K Chandrasekhar Rao had taken a decision that vacancies against sanctioned posts in all these departments be filled on contract or outsourcing basis till the sanctioned posts are filled on regular basis. Accordingly, permission has been given to fill up the 2,101 existing vacancies on contract or outsourcing basis till regular recruitment is done. Thus, the process of filling these vacancies will soon begin. 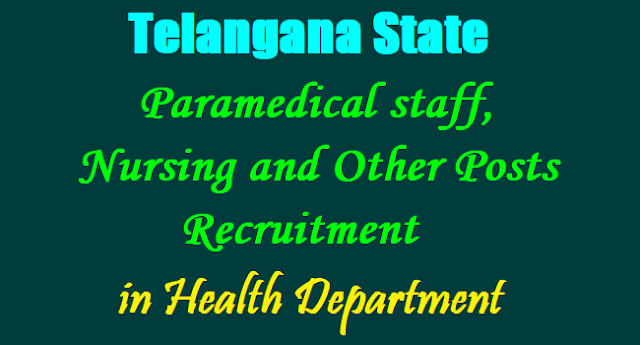 GOVERNMENT OF TELANGANA, TM&HS - Filling up of the vacant posts of paramedical staff and nurses under the control of Director of Medical Education, Telangana / Director of Public Health & Family Welfare, Telangana and Commissioner, Vaidya Vidhana Parishad, Telangana on contract / outsource basis - Permission - Accorded - Orders - Issued. ORDER: In the Collectors conference the Hon’ble CM has taken a decision that, vacancies against sanctioned posts of Paramedical Staff, Nurses shall be filled on Contract / Outsourcing basis by the District Collectors till the sanctioned posts / vacancies are filled on regular basis. 2. Accordingly, the Director of Public Health, Commissioner, Telangana Vaidya Vidhana Parishad and Director Medical Education, TS, Hyderabad have submitted the proposals in the references 2nd to 4th read above. 3. Government after careful examination of the matter, hereby accord permission to fill up the following (2101) existing vacancies on contract / outsourcing basis till regular recruitment is done, under the control of Director of Medical Education, Telangana / Director of Public Health & Family Welfare, Telangana and Commissioner, Telangana Vaidya Vidhana Parishad. 4. The Director of Public Health and Family Welfare, TS, Hyderabad Commissioner, Telangana Vaidya Vidhana Parishad and Director of Medical Education, TS, Hyderabad and concerned District Collectors shall take necessary further action to fill up the posts accordingly on contract / outsourcing basis, duly following the existing rules and conditions as per reference 1st cited till the regular recruitment is done. 5. This order issues with the concurrence of the Finance (HRM.VII) Department vide their U.O.No.3168/230/A1/2017, dt:18.5.2017.